I’ve never paid close attention to the cafeteria-related notices at the boys’ school. Both of my kids bring their lunches every day, and that’s the way they like it. Lunch menus come home faithfully each week, only to be chucked directly into the recycle bin without so much as a glance. 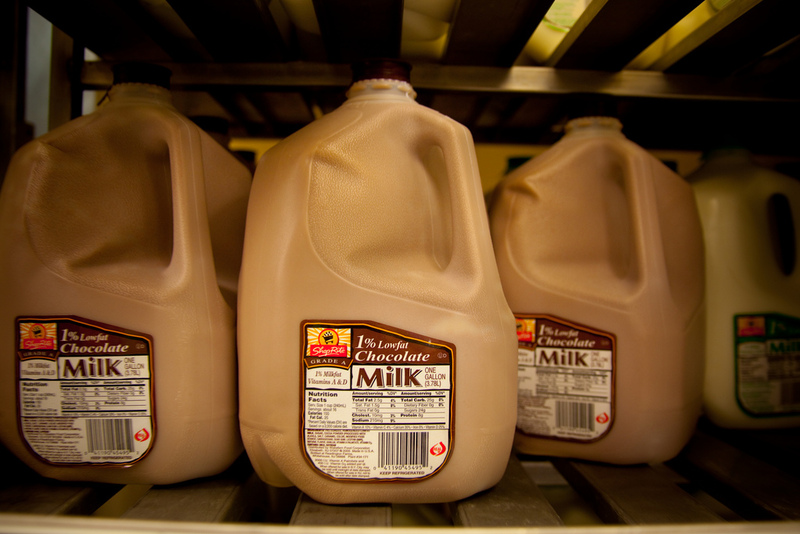 The “free milk” application comes home in the first-week folders every year, and is subsequently ignored while I handle the rest of the mountain of paperwork that’s required to keep two kids in school these days. Our kids go to a small parochial school near our house, where there’s not a “real” lunch program; instead, a local deli/pizzeria provides lunch each day to kids who have ordered and paid no less than a week in advance. For the record, I have always been absolutely willing to let the boys buy lunch occasionally, even up to once a week, if they want to. I view learning to make lunch choices in a cafeteria environment as a life experience they’ll need to have at some point. But they’ve never wanted to buy, and when I peek at the options, I’m relieved. The weekly choices range from things like pizza and calzones to hot dogs, mac and cheese, and the occasional ham or turkey sandwich — all served with sides like pudding, chips and french fries. There are sometimes mandarin oranges or a side salad offered, so it’s not all dismal, but I’m a lot happier sending a home-packed lunch. Since we’ve been in this routine now (receive lunch menu — ignore lunch menu — recycle lunch menu — repeat) for nearly four years, since L. started kindergarten, it was a bit of a surprise to me when he came home one day and asked for milk money. “Milk money?” I asked. “I…what? You’re planning to buy milk? It…how much IS it, even?” You can tell from my stammering that he had caught me completely off-guard. I was treating the subject of milk like it was some foreign language. He’s been drinking coffee milk at school? Since when? How often? It was going to make the sugary milk more desirable. Knowing that L. had already neglected to mention to me that he’d been treated to coffee milk at lunchtime by his friends, it wasn’t hard to imagine that — although he’s generally an unusually honest and straightforward child for his age — he might start to feel the urge to sneak sweetened milks at school. And sneaking food is DEFINITELY not a behavior I want either of my kids to acquire. That’s ADDED sugar, of course, but I appreciated the fact that he’d at least tried. A little more information from him reassured me that the milks being sold were, at least, made with actual sugar (rather than high-fructose corn syrup) and no artificial flavors or colors, which meant they would be safe for dye-allergic P.
Now, I know it probably sounds like I’m equivocating here. A sugary beverage is a sugary beverage, after all. And yes, in this house, we generally treat our chocolate (or coffee) milk as a dessert option rather than a drink. But if I’m honest, I’d rather they drink a no-artificial-anything, plain-old-sugar sweetened milk every once in a while than a can of Coke. Besides, there’s still the matter of that social cache — remember, their classmates are allowed to buy the milk. And sure, I could launch a petition campaigning to get the milks removed from the cafeteria, but: 1) I know my audience, and after years of sizing up this school community, I am aware that there would be pretty much zero support from anyone for such an action; 2) The milks are entirely voluntary on the part of parents, which to me makes them a different issue than something like a school-provided mandatory snack or a school-provided lunch menu that’s served to kids in need; 3) I prefer to save my activism for really big fish, and this ain’t one; and 4) You gotta let go sometime. So for three weeks or so now, there has come a morning each week when they march off to school with their Velcro-closure wallets tucked into their backpacks, proud to make their own purchasing decisions, happy to have a little buying power. More than that, I think, happy to have a little taste of freedom, a little independence bought with forty-five cents and the requisite “please” that it takes for the milk lady to hand over the goods. I suspect there will come a time when the bloom is off the rose and they don’t buy milk every week anymore, but in the meantime, I imagine that it’s a sweet rite of passage for them. Moreover, for me. In a hundred small ways, I can no longer supervise every choice they make, every food they eat, every friend they make, every homework assignment. There are no more daily progress reports that tell me when they ate, slept, and used the potty — those were gone ages ago, and I’m surprised to find that sometimes I still miss them. They pick out their own friends, their own books, their own clothes, and yes, sometimes their own foods now, without my help, and often not quite caring what I think of their preferences. They’re big kids, now. And big kids buy coffee milk.